This is another review I have to give Jim over at Jim's Chocolate Mission a shout out for. Jim reviewed this bar a few months ago (check it out HERE) and it just looked and sounded like something I had to try. I admit, at first I had to do a Google search to find out exactly what Turkish Delight is- and for those of you that don't know it's a candy made of sugar and starch (sort of like Boton Rice Candy)and it is often flavored with things like Rose Water, lemon or even mint and nuts. 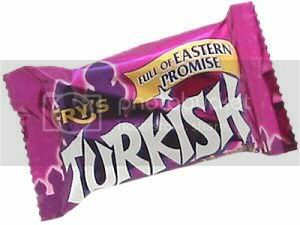 Fry's Turkish Delight is a Turkish Delight center that's enrobed in a thin layer of milk chocolate. Once you open the bar give it a good sniff, it has the faint scent of rose water. The chocolate is very sweet, slightly gritty and it melted at a strangely fast rate (or maybe I am just so hot that I melt things instantly!). This bar is not about the chocolate, it's about the filling. The Turkish Delight texture wise is- depending on your point of view- either a very firm jelly or a very soft gummi. I want to say it was sticky, but that's not really the right word. It was more like tacky. I LOVED the flavor! it was a soft rose water with a hint of lemon and a sweet finish. It almost reminded me of a solid form of Persian Ice Cream. I did something I don't often do with this bar- I finished it in one sitting! Labels: Candy, Chocolate, Imported, Imported Candy, Milk Chocolate, Rose, Turkish Delight, U.K.
Hi Gi thanks for the shout out! I am amazed you get to try so many of the things you see on my blog! I always see stuff I am desperate to try on yours but just don't have the means of getting hold of it! By the looks of it you have a few 'Brit' stores round you!! If this product had a thicker layer of milk chocolate it would exceptional!! I am pretty lucky that since I have moved back to Southern California that within 25 miles of my home (which is nothing in SoCal mileage) I have an Italian grocery, a German deli, a Dutch shop, a Brit tea room and a pretty impressive Asian market so I can find a lot of interesting things. And yes, if only the chocolate had been thicker. It was still pretty spiffy! !